We’re in the middle of Typhoon season in Japan and another big typhoon named Jebi is set to hit Tokyo on September 4 and 5, 2018. Transportation and flights may be affected. Tokyo Disney Resort stays open in most cases but trains may be delayed and/or canceled depending on the conditions. For more information on what happens at the resort during a typhoon (ride closures, show cancellations, etc), please see our guide below. If anything major happens, we’ll keep you updated. While on your trip to Japan, you’ll likely experience a few rainy days. The rainy season starts at end of May until mid July. It doesn’t rain every day, but you’ll see more rainy days on average. This also brings the humidity. While August and September (sometimes into October) is Typhoon season (strong winds and rain). 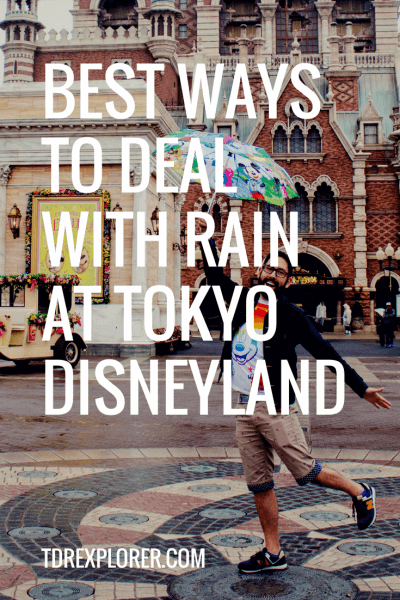 It’s important to know how the rain affects your time at Tokyo Disneyland and Tokyo DisneySea. This guide gives you my best tips and advice on how to handle rainy days and what to expect. 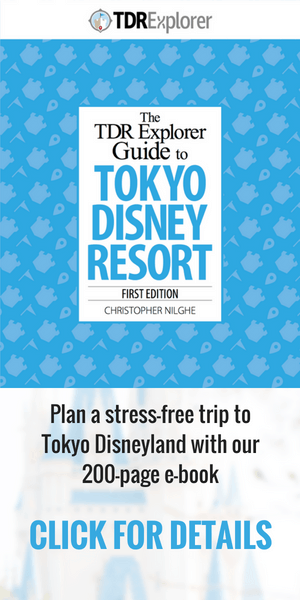 If you found this article useful, you’ll want to check out our 200-page travel guide e-book on Tokyo Disney Resort. It has everything you need to plan the perfect vacation to Japan. 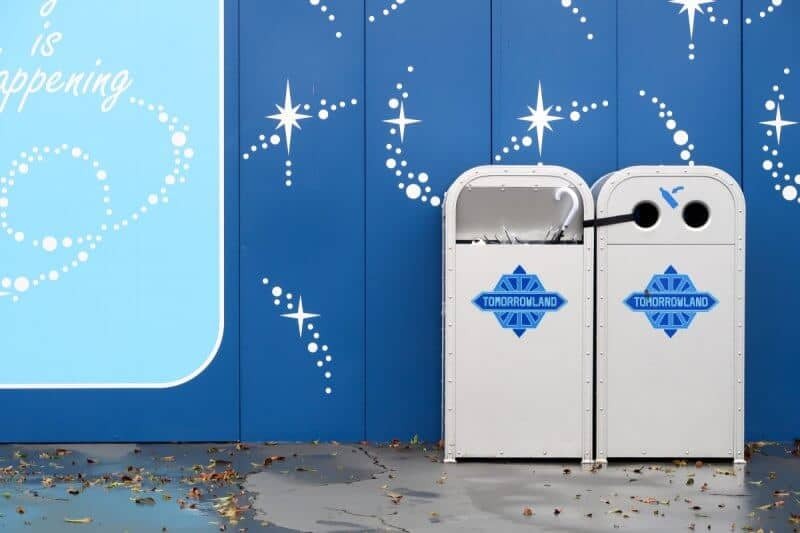 Here’s a short list of what to bring with you to the Parks. 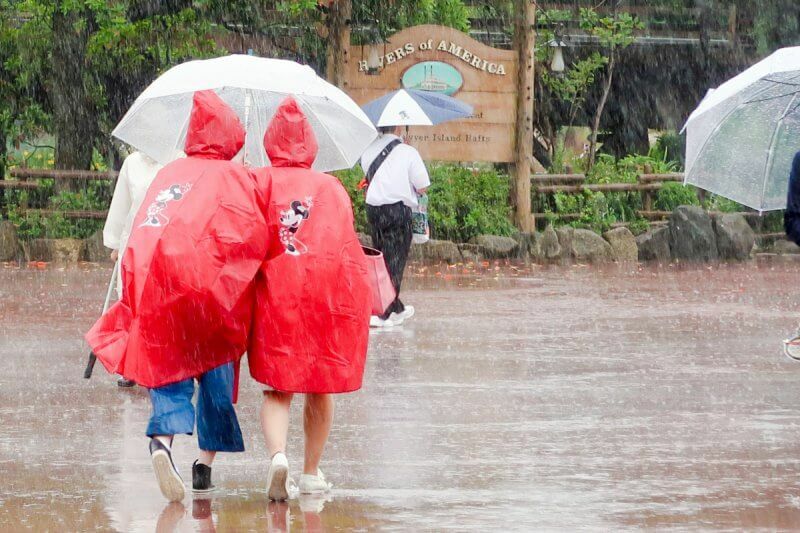 You’re able to buy ponchos & umbrellas in the Parks (at various shops) but they come at a cost. It’s best to buy things from either a convenience store (slightly cheaper) or from the 100 yen store (Daiso). The closest Daiso to Tokyo Disney Resort is at Shin-Urayasu Station. If you’re staying at one of the Disney Hotels, ask for a shoe warmer for your room. You won’t regret it, trust me. Don’t waste money on a nice umbrella since all it takes is one gust of wind to destroy it unless it’s a fancier umbrella that is able to go inside out without breaking. Unless it’s a weekend or public holiday (where many Explorers have bought day tickets already) expect lighter crowds on rainy days. During the end of the day, if it’s still raining, the crowds become almost non-existent and attractions become walk on. I recommend TDR Dash for iOS and Android to check wait times. 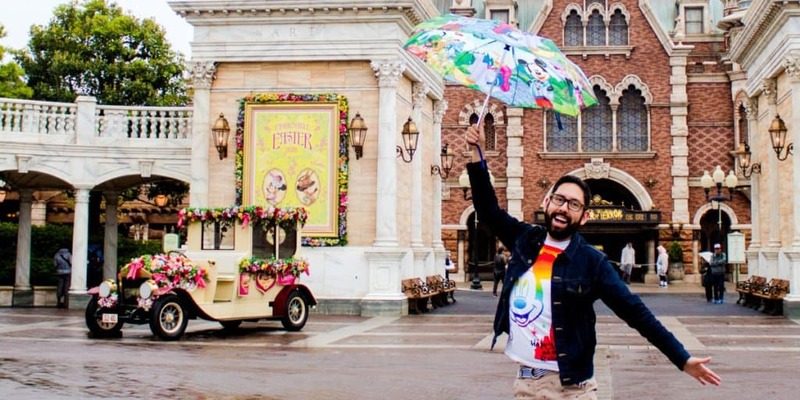 Read our guide on when to visit Tokyo Disneyland to help decide when you should visit. Also, always consult the crowd calendar (there’s an option to turn on what the predictions are when it’s rainy). During light rainy days all outdoor attractions run normally. If there are strong winds and heavy rainfall, then outdoor attractions may close. 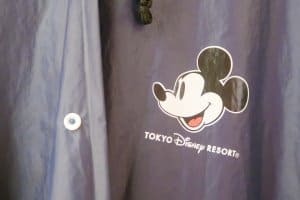 The harbor shows at Tokyo DisneySea also have a rainy day version with characters in their rain gear on the barges in the harbor (no dancers). 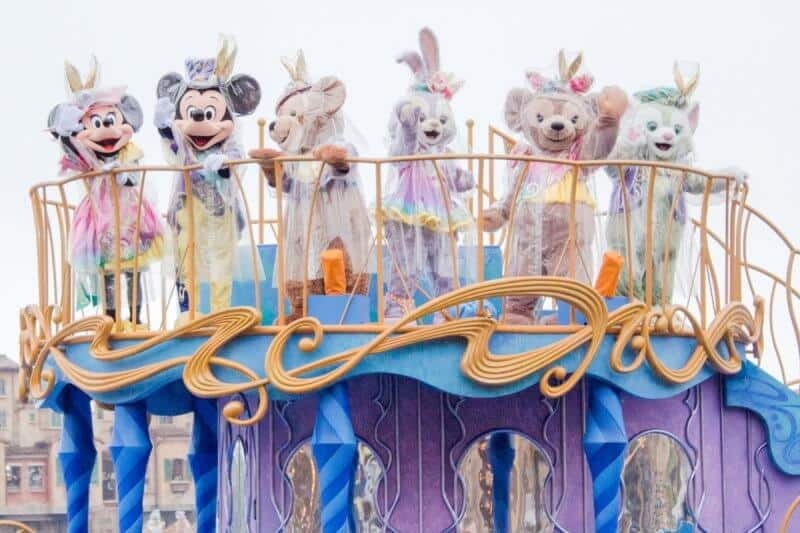 Tokyo Disneyland has three special character greetings that only happen on rainy days. 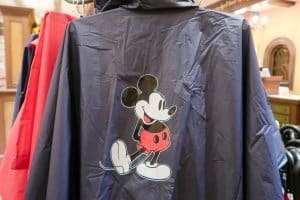 At the front of Tokyo Disneyland, you’re able to meet Mickey and Minnie in their special rain outfits. 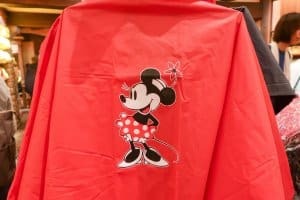 Then over in Toontown, Daisy greets guests in her cute raincoat. These only happen during the day. 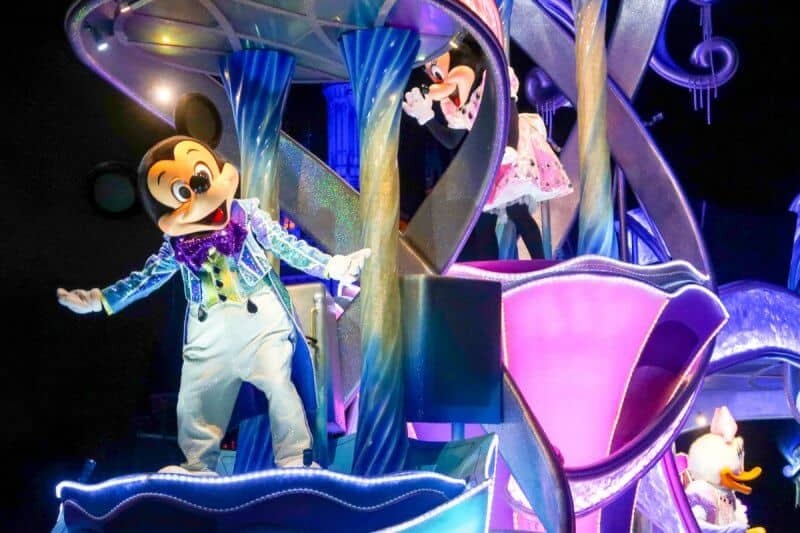 Other characters still greet guests in the World Bazaar in Tokyo Disneyland, under the walkway of Hotel MiraCosta, and in Mermaid Lagoon at Tokyo DisneySea. If you play the carnival games at Tokyo Disneyland (Adventureland) or Tokyo DisneySea (Arabian Coast) you have the chance to choose from a special rainy day pin that’s only available on rainy days. You’ll want to “lose” if you want the pin (if you win you’ll get a plush). Each play costs ¥500 ($4 USD). Are you planning a trip to Japan? 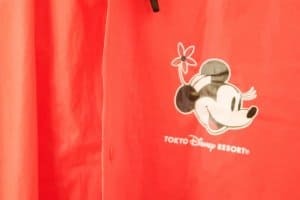 Take the anxiety out of planning a trip to Japan with our premium ebook travel guides on Tokyo Disney Resort & Universal Studios Japan. Our guides have everything you need to know from the best times to visit, what hotel to choose, what to do, what to eat, and tons more! With nearly 2000 copies sold, our premium guides have become an essential tool for Explorers! Get all your discount tickets for Tokyo Disneyland, Robot Restaurant, Universal Studios Japan, and more through our tickets page (includes an exclusive discount code). 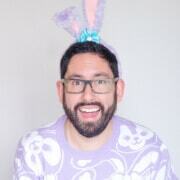 For my personal recommendations on SIM cards, portable wi-fi devices, travel insurance, cheap flights, and hotel bookings, read our travel resources page. Do you love exclusive and early access to content? Support us on Patreon as it helps us continue bringing you free and continuous content to help you plan your trip. Make sure to follow us on social media to stay updated on everything Tokyo, Hong Kong, and Shanghai! Instagram, Twitter, Facebook, Pinterest, and YouTube.